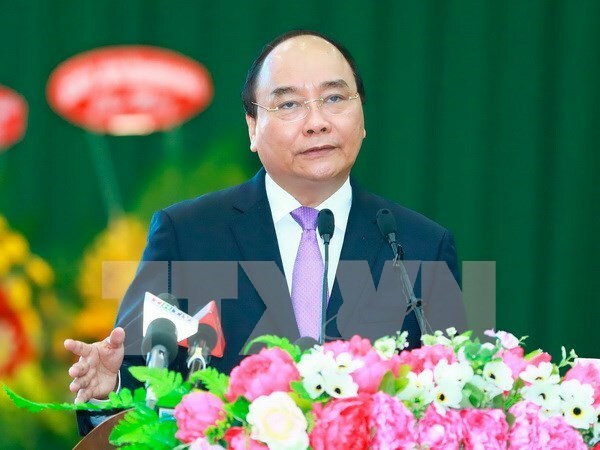 Hanoi (VNA) – Prime Minister Nguyen Xuan Phuc, his spouse, and a high-ranking delegation of the Vietnamese Government left on April 24 for an official visit to Cambodia. The two-day trip is made at the invitation of Cambodian PM Samdech Techo Hun Sen and his wife. This is the first official visit to Cambodia by Nguyen Xuan Phuc as Prime Minister and an important diplomatic activity in the Vietnam-Cambodia Friendship Year 2017. It aims to enhance the friendship and sustainable comprehensive cooperation of the two countries. Vietnam currently has 190 investment projects with total registered capital of 2.89 billion USD in Cambodia, mostly in agriculture and forestry. Cambodia’s investment in Vietnam totals 18 projects worth 58.125 million USD at present. Bilateral trade exceeded 2.9 billion USD in 2016 and is estimated at 936 million USD in the first quarter of 2017, a year-on-year increase of 11.6 percent. Cooperation between the two sides’ ministries, sectors, localities and organisations has been reinforced through delegation exchanges, mutual support in economic development, collaboration in health care and culture, and people-to-people exchange, helping maintain peace and friendship along the shared border. About 960,000 Vietnamese people visited Cambodia last year, making Vietnam the biggest source of foreign tourists to the country. Both sides are working to organise activities marking 50 years of their diplomatic ties (June 24, 1967).